Added lots of colours- white, silver, spotted, starry, glowing. 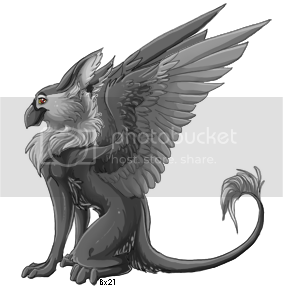 *gags* New eyrie adoptables are a must. Coming soon! 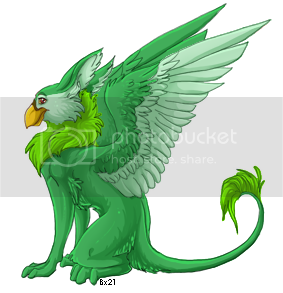 Hoorah for a new fire eyrie adoptie! 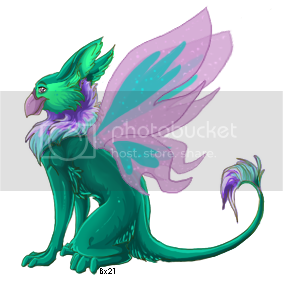 Added a spotted and christmas eyrie adoptie! Also *drum roll* Alkazar finally has a story (no introduction yet though) and dividers! Items on my to-do list are write the introduction, finish all the adoptie colours, make new makeables and add a few extra section! Keep an eye out for these changes! 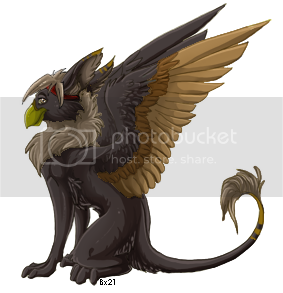 Okay, I'm finally gonna get back to work on Alkazar's page- new blog, new adopties! Incoming story. *tacklehugs griffinrose* Thanks so much for the uber cool adoptie! Much appreciated! Welcome You trudge through knee-deep freezing snow, the fiercesome wind howls and rages around you, cutting through the thick layers of clothes like knives. The snow pelts your body incessantly and all you can see is swirling whiteness. You've been in this blizzard for almost an hour and your strength has been sapped. Your limbs feel weak and you can't feel the extremities of your body. A particularly strong gust of wind knocks you to the ground and you stay down, with no energy left to get back up. Blackness creeps in at the edge of your vision and you swear a shadow is descending upon you. You sigh and the blackness overtakes you and you wait for the inevitable. The distant howling wind awakens you. Coming to your senses, you realise that you feel warmth. Opening your eyes you find yourself in a large cave with glimmering walls. Sitting up, you find that you are covered with a white glowing blanket that has the appearance of being made from light. Cautiously you try to touch it and it disappears in the blink of an eye. Standing up you revel in the fact that all your fingers and toes are intact....you were sure that they were lost to frostbite. But how did you get here? The question burns in your mind. Peering out of the cave, you see that the blizzard has abated....and there, sitting some 60 metres away on the edge of the plateau, is a magnificent blue and white eyrie, surrounded by dancing and twirling wisps of light. You trudge you way up to the eyrie, praying that this was the one who you were rescued by and not another ill-willed creature. You stand a few metres away, silently waiting for a response. The creature turns and glances at you before turning back to gaze forward. Timidly you step forward to the edge of the cliff to look down before reeling away with shock and vertigo. The drop is a least two miles high, into a deep secluded valley. Both sides of the valley are bound by monstrous sized mountains, the bases of which are shrouded in thick mist. You plunk yourself on the snow, taking deep breaths. The eyrie lets out a sudden, unexpected yet hearty laugh before finally speaking in a gentle ringing baritone "Not used to such heights are you human? This is the terrain of the Eira. Very few humans ever make it here so consider yourself fortunate to have witnessed these lands." One dancing wisp pulls away from him and twirls itself around you before settling in your lap, a glowing ball of warmth. A few minutes of silence pass before you venture a question "Who are you?". The eyrie keeps his gaze ahead watching the gentle powdery snow that begins to fall. "I am the guardian of these lands." He answers simply. Annoyed, you ask him to elaborate. He laughs again "Are all humans so foolish and inquisitive? Very well, I will elaborate but only because it will help pass time." A pure white eyrie soared low over the tree tops, her white coat glistening like dewdrops in the morning sunlight. As she beat her massive wings, a thick mist trailed behind her, settling on the trees like a cold white blanket. Alikana was a magnificent white and dappled grey snow eyrie from the Isaria tribe. Snow eyries, or the Eira were a rare race of eyries who resided in cold snowy areas, fairly secluded from others and most were skilled in snow and ice magic. Alikana usually went on a morning flight throughout the valley and mountains in which the tribe resided, even though the elders believed this was dangerous. However she reasoned to them that it was necessary for her sanity as she was a loner, and for the safety of the tribe as she acted as a scout for danger. Sweeping along a plateau towards a cliff, she folded her wings close to her body and plunged over the edge. She let out a cry of exhilaration as the cold wind rushed by and she flared her wings open, pulling out of the dive just before she reached the ground. She sighed happily. If only the elders weren't so conservative when it came to change. Continuing on her scout of the area, she flew lazily over a clearing with a large tree lying in the center, seemingly freshly upturned. Pausing over the clearing, an unfamiliar scent reached her....another eyrie. Hesitantly she landed in the clearing. If this foreign eyrie posed a danger to the tribe, she must be able to alert the elders. Cautiously she padded around the tree with her soft paws, sinking into the deep snow. She paused again as the scent assaulted her again, stronger than before. Crouching close to the ground, she stalked around the tree, expecting an attack at any moment. Suddenly she froze, the back of her mane bristling. The snow in front of her was stained with traces of blood. Straightening up, she examined the whole area, also finding patches of white fur and claw marks on the tree. She concluded that a snow eyrie, however not one of her tribe but perhaps an exiled one, had been attacked by a creature of some sort. By the appearance of the claw marks, Alikana reasoned, it had been a snow monster....Graarg was know to haunt this area. Burning with rage, she crouched to launch into the air, when a flash of blue caught her eye from amongst the leafy branches of the fallen tree. Pushing the branches aside she let out a low hiss. Lying nestled among the branches was a blue Eira egg. Alikana examined the egg in amazement. Snow eyrie eggs were always white with speckles of blue or grey. It was a characteristic trait. They were never inverted, in this case completely blue with white speckles. Clutching the warm egg between her front paws, she launched into the air to head back to the tribe, wondering how this strange egg would be received by the others. No!!" 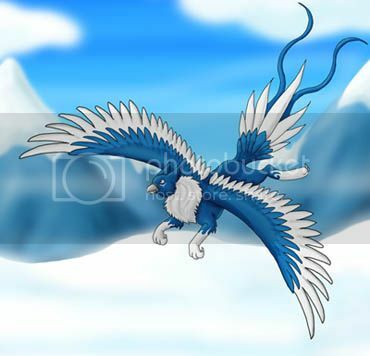 The huge white eyrie screeched, rearing and flaring his wings. "Absolutely not! It is unnatural! It must be destroyed!!" Alikana hissed back "So you would destroy an innocent life because it is different? So what difference does it make if we are white and grey and it is blue? It is still one of us! It must be given a fair chance. I cannot believe that you who are so wise would believe otherwise." The air grew frostier around her as she continued to rant "If no one wishes to adopt the hatchling, I will do so myself, regardless of what you decide!" Elder Haraka sat down on his haunches, the rage in his eyes dying out. He let out a long sigh. "Calm down Alikana. Fine. We will raise the hatchling, though it is against my better judgment. Keep in mind it was you who insisted." Alikana bowed low to the ground. "Thank you Elder. You will not regret this." Gently she picked up the egg and padded off, white snow drifting behind her. 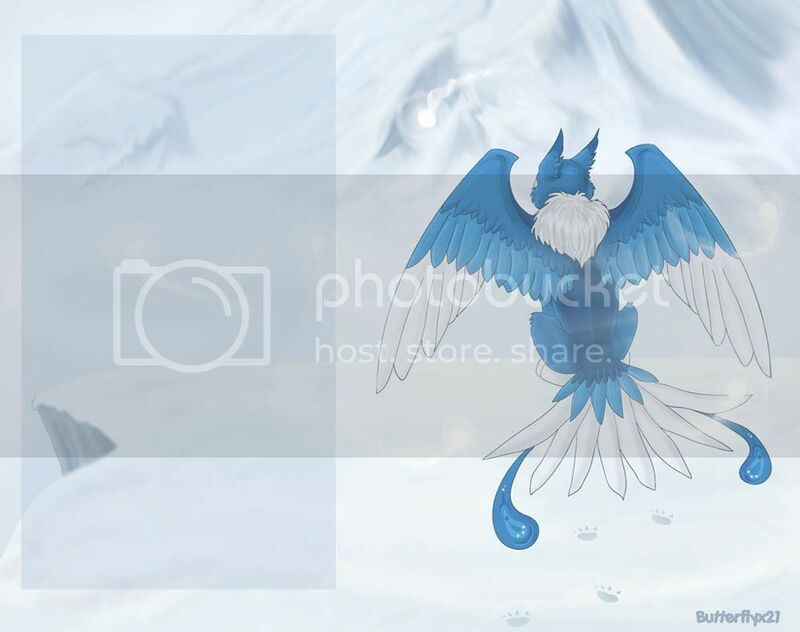 A medium sized dark blue eyrie bounded through the snow and pounced onto a light grey eyrie, tumbling them both head over heels into the powdery snow. "Gotcha!" Alkazar shouted cheerily before bounding off towards the trees. He raced in between the dappled grey trunks, weaving in and out before leaping into a clearing. A shadow descended on him and he was pushed face first into the snow. "Gotcha back!" giggled Selken. Alkazar stood up and shook the snow out of his fur. "No fair! You flew!" Selken crouched down "so what? Not like it matters, I would have got you anyways." Alkazar shrugged "Perhaps, but you know I can easily hide myself with a fog spell. Selken rolled over "So? You are the strongest of the young ones, but it doesn't make it fair to use your powers like that." Alkazar snorted "It doesn't matter how strong I am, all it does is isolate me from the others. You are my only close friend. I believe the others are...afraid of me because I am different. But in any case..." Alkazar faltered, searching for a new topic. "I'm bored. What should we do?" Selken stretched and stopped midway through a yawn, his eyes widening in excitement. "You know what we could do? Visit the snowager's cave!!" Alkazar stared at him apprehensively, flicking his thin tail. "Are you sure? My mother Alikana would kill me. You know she told us to stay away from there because it's dangerous. Selken smirked "What, are you afraid? Big Alkie's scared of a wittle snake?" Alkazar rolled his eyes "Fine. We will go to the Snowager,"
Alkazar and Selken stood in front of the Snowager's cave, the dark depths of the entrance yawned before them. Alkazar shivered with foreboding. Every instinct in his body told him to turn back, but he couldn't back down in front of Selken. He would never live it down. Selken turned and grinned at him "Ready?" Alkazar merely nodded and took the first step into the cave. Slowly the both of them trekked deeper into the winding network of caves, the icy walls chilling the two young eyries despite their thick coats. There was a musky scent in the air which told them that they were near the snowager. Taking careful steps, the two eyries peered around a stalagmite. The Snowager lay asleep on his treasure, breathing deeply. Selken grinned and whispered "Go on, go get something". Alkazar gave a little nod and padded towards the giant icy snake, not making a sound. He stood in front of the pile of loot, holding his breath he reached out and picked up a silver weapon without a single noise. Clutching it in his beak he stepped back and froze as a muffled thump sounded behind him. What was Selken doing?!!! Alkazar turned to Selken and saw him lying on the ground, beak wide open and pale blue eyes staring. Terror rushed through Alkazar like electricity, flooding his system with adrenaline. Turning back to the Snowager he found himself staring into a huge icy blue eye. Alkazar stood still for a frozen moment before screaming "Run!!". He bolted after Selken through the winding tunnels, praying they were going the right way. The Snowager, not far behind them let out a resounding roar which echoed through the walls of the ice caves. Selken, just ahead of Alkazar shouted out "I can see the entrance! We're almost out!" At his announcement, a huge cracking sound resounded above them and stalactites came crashing down around them. The ground trembled from the impact. Alkazar stumbled and suddenly searing and blinding pain ripped through his body. He let out a resounding screech and blackness closed in on his vision. Alkazar stirred and let out a low groan. His body felt stiff and painful, like he had fallen off a cliff. In particular his tail felt numb. He could feel that he was lying on a soft bed, inside a hut. "Alkazar? Are you awake?" He opened his eyes at his mother's voice. "How long have I been out? What happened?" He murmered, his sight swimming with the effort. "Alkzar, my dear, you are in the healer's hut....and have been unconscious for a week. You... I mean..." his mother spoke hesitantly as if she wasn't telling him something, "In the Snowager's cave.....you were hit by a falling Stalactite and injured severely." Alkazar sat upright, making himself feel dizzy "What are you talking about? I feel fine." He winced as he said it. His back ached, his cracked ribs were bandaged and his tail still felt numb. A tear rolled down Alikana's face. "Alkazar.....your tail...was severed and your wings damaged" He stared at her in disbelief and turned around. His tail was nothing but a bandaged stump. His voice left him completely. An eyrie without a tail? And damaged wings? How ridiculous he would look! He wouldn't be able to keep his balance or fly properly! An eyrie's tail was his counterbalance... He felt faint at the thought. Now the others would never accept him, despite the fact he was already an outcast due to his stark blue coat and the strength of his abilities. Now not only would he be an outsider, but an object of ridicule. Alkazar trudged home after a day spent hunting. He had caught nothing, despite him usually bring home at least three fish from the nearby lake. Today his heart just hadn't been in it. Stepping inside the small hut, he curled up in front of the fire, trying to reflect on what was wrong. Ever since he had lost his tail and damaged his wings, the reaction from the tribe hadn't been as terrible as he expected. Instead of being shunned, he was pitied, which in his opinion was worse. He was still powerful in his abilities, but he was considered an invalid, a broken creature by the others and he struggled to fly without his tail to balance him. He was pathetic. Alikana walked in silently, her face full of determination. Alkazar stared at her and realised something was going to happen. Something he probably didn't want to hear about. "Mother....what is it?" Her face contorted as he spoke. "Alkazar...I must tell you the truth. You are not my hatchling....I found your egg in a nest that had been attacked by Graarg. Your true mother I believe was fatally injured. I'm sorry Alkazar.....I should have told you sooner, but I just couldn't. I love you too much to see you hurt and I know it hasn't been easy. Alkazar?" He stood rigidly still, letting Alikana's word's sink in. Finally he spoke gruffly "It's okay....I understand, and know that I will always love you as my mother for you have raised me and cared for me. I always knew I didn't fit in." He stood softly and padded out the door. He left the village and trudged north, towards the valley's largest mountain, stumbling over rocks and tripping over branches hidden in the snow, but never stopping the uphill trek. An hour later, instinct pushed him further on despite his aching and injured paws. Soon he stood on a cliff, overlooking the village far, far below. Nearby was a clearing with a single stump in the center. He climbed onto the stump and curled up, wondering why he had been drawn to this place. He lay on the stump for what felt like hours, watching, waiting, but for what, he knew not. A cracking branch woke him. Jolting upright he turned around. A grey yeti-like snow monster sat in the clearing, grinning eerily. "So the odd hatchling has come back. He smells...familiar." The creature stood sniffing the air. "Ah, now I remember." He smirked "The white eyrie female, many years ago. Does the hatchling want the same treatment as his mother?" A blind rage stirred in Alkazar's chest like he had never felt before, like a dark shadow creature rearing. Some strange part of him suddenly connected inside him, like two wires meeting together for the first time, tapping into his well of limitless power. Closing his eyes, he reached into the well and drew out a thread of simmering magic, focusing all his power, rage and resentment onto the magic, whilst still maintaining his hold on it. He turned his sights onto Graarg, who had started laughing, a low chortling noise. The snow beast now crouched and leapt forward, triggering Alkazar to loosen his hold on the magic. The result was devastating. The maelstrom ripped through the clearing, devastating everything within range. Alkazar howled with fury, the snow, ice and debris swirling around him like a hurricane. He fueled it with his sense of loss and resentment of everyone, making the maelstrom grow larger and stronger. The wind howled around him, tearing at his fur, chilling him, but still he maintained the storm, the ring of devastation reaching further and further. What seemed to be ages later, a voice rang through the storm, cutting through Alkazar's concentration, but he still managed to keep his hold on it "Alkazar......you must stop.............village will be ....destroyed.............its me......Selkan......your friend!!" At Selkan's last word, Alkazar felt all the rage and pain drain away, leaving him feeling empty and devastatingly tired. He collapsed on the ground, the maelstrom abated, showing the destruction he had caused. The land was devastated, trees upended, debris lying scattered all over the clearing. Selken landed by his side, looking both concerned and frightened. "Alkazar....are you okay?" he asked softly. Alkazar grinned weakly "Right as rain" before his vision became shrouded in darkness. Out of the darkness a soft blue light grew, and a gentle voice spoke. "Alkazar. You have been through much pain and grief. I can heal your physical hurts but only your friends can heal your spirit. You must not isolate yourself from others because you believe yourself to be an outsider. The truth is, some will always will be afraid of you or resent you for you are an Ice Elemental. You were destined to be different. Elementals are born once every seven centuries or so, and are quite a spectacular rarity and terrifyingly powerful. They are blessed with great power and you must use it for the betterment of others. Make a fresh start and forget your old wounds, or they will eat at you forever. Please accept my gift" The glow momentarily turned into the shape of the snow faerie before fading again, along with the voice "Goodbye Alkazar, we shall meet again." Alkazar woke once again in the healer's hut, but this time he felt better...much lighter and whole. His body didn't ache and the tiredness was gone. "Alkazar?" His mother's voice echoed. "Are you okay buddy?" Selken's voice chimed in after her. Alkazar opened his eyes and saw the one of the village elders, Haraka, standing nearby, along with some others who had previously avoided speaking to him. He sat up in the bed, while Elder Haraka stepped forward. "Alkazar, we can now see that we have been blessed with an elemental in our very midst. We humbly ask for your forgiveness to the way you have been treated at times. We have grievously erred and wish we could change the past, but of course we cannot. Instead we ask that we begin again." He bowed and stepped back. Alkzar stared disbelievingly at the group, stunned by what he had heard. Eventually he murmured a reply of "yes, of course." When everyone left, he stepped off the bed, savoring his strange feeling of well being. The moment his foot touched the ground, he instantly knew something was different. His balance was....perfect. Craning his neck, his shock of the past hours events escalated. He had a tail again, but a different one.....feathered like a bird's. The faerie had indeed healed him. Maybe this was part of the reason that the others acted so reverent towards him. He ventured out of the hut and spread his wings again for the first time in years and launched himself into the sky, screeching with delight. He soared high like he had never had before. Skimming over a lake, he saw his reflection and was shocked to see his plumage had also changed to different combinations of blue and white. Snow Eyries, or the Eira as they call themselves, are an ancient race of eyries that thrive deep in the icy mountains and hidden valleys of Terror Mountain. They are a secluded race that have lived for thousands of years, due to their extremely long lifespans of over 5 centuries. Since the beginning, they have seperated themselves into five tribes, each led by three Elders who guide and teach the others. Snow eyries traditionally have white fur white grey or blue markings, likewise, their eggs are white speckled with blue or grey. Their innate magic ability lies in the element of ice and snow. Each eyrie's power and skill varies dramatically, but the basic spells that they can cast are of fog, wind, ice and snow. However, each spell cast is less than a planned pre-meditated action, but rather a natural thing that occurs. Snow Eyries are fierce creatures, protective of their homes and kin, and they prize honour, skill and intelligence above all, but detest any change within their communities, especially if it is out of their control.